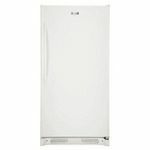 The Frigidaire Frost Free Upright Freezer is the way to go! I have always wanted a separate freezer so I could purchase cows direct from the farmer and have the room to store it all. So I decided to purchase the Frigidaire Frost Free Upright Freezer. Now I grew up in a house where we had a standard upright freezer and I remember seeing 6-9 inches of ice consuming the inside of the freezer over time, it was awful. Every 3-6 months we would have to empty everything out and chip away at the ice and then put everything back in. The Frost-Free function on this freezer however eliminates that completely! **Pros:** Frost-Free is the BEST thing about this freezer (as mentioned above). If you ever buy a freezer (no matter the brand), make sure it has Frost-Free! Storage in this freezer is great due to the customizable shelving. It can fit an entire cow, and still have room for more meat! 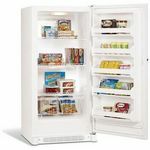 Lastly upright is a pro on its own, as the wide freezers require you to bend over and it takes up a lot more floor space. **Cons:** I have yet to find anything wrong with this freezer whatsoever. I've had no frost build up or any issues with the temperature control. **Overall:** If you are looking for a place to store bulk meat/freezer items (Whether you buy a cow, purchase from Omaha Steaks, or go to Sams Club), this is the way to go! 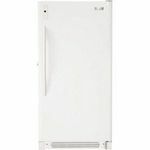 Also make sure you buy the extended warranty, as freezers can last a long time if you take care of it and things do happen to break over time with anything; better to keep it "insured" than have to completely replace. I love my frigidaire. I own several other of their products. They are reliable and inexpensive. I hope this review helps all those interested in purchasing household appliances. I would definitely count on them. the products are simple to use. I hope you consider buying this when you are ready to purchase items for your home. They are easy to clean. make sure you use safe detergents. 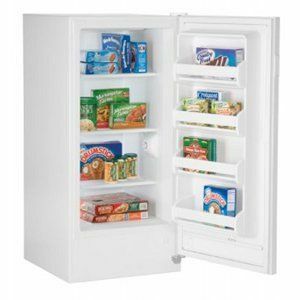 I absolutely love my Frigidaire Upright freezer! I love my Frigidaire freezer! 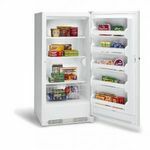 The main reason that I like my upright freezer is that everything is easily accessible, easy to organize, and easy to find what you are looking for once it is in the freezer. I also do not have to worry about whether or not I am going to fall in. 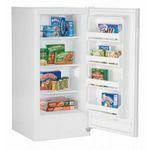 I am not a very tall person, so when I had a chest freezer it was always hard for me to reach what was inside, it was hard to organize things and keep them organized. Heaven forbid if things were to even get slightly messed up in the chest freezer, because then I would have a hard time finding anything. I also had the added worry about falling in (my husband can vouch for this one, many times he has had to get things for me because I could not reach them). So I told my husband the next time we go to buy another freezer I was going to pick it out. Now he even agrees that the upright is better because you can find things easier by just opening up the door and easily viewing what is inside. You also do not have too worry as much about an upright getting messy, because if something were to get out of place you can still easily find it!